Happy Friday! Since Tuesday was Valentine’s day, it was fitting to have a super romantic story about Ebola super-spreaders and their role in causing most of the cases. Have you ever wondered why killer viruses are on the rise or what some of these infectious disease terms mean? If you missed this event or weren’t able to make some of the sessions, check out our overview! GMU sent four graduate biodefense students to ASM’s biothreats conference to not only aid in their education, but also to report back for our readers. With their unique backgrounds, we’ve got articles on the FDA’s Animal Rule, international biosecurity efforts, and more. Check out the link above and you’ll find a special edition post with all of our highlights. A new report from an international committee put together by the U.S. National Academy of Science and the National Academy of Medicine found that a clinical trial regarding DNA editing of a human embryo “might be permitted, but only following much more research” on risks and benefits, and “only for compelling reasons and under strict oversight.” Consideration would be given to couples who are both afflicted with serious genetic disease and editing is “really the last reasonable option” for them to have a healthy child. While some applaud this as a first step towards a very specific and narrow subset of DNA altering, “others see the report as lowering the bar for such experiments because it does not explicitly say they should be prohibited for now. ‘It changes the tone to an affirmative position in the absence of the broad public debate this report calls for,’ says Edward Lanphier, chairman of the DNA editing company Sangamo Therapeutics in Richmond, California.” You can read the full report here. GMU Biodefense PhD student and Predoc at Lawrence Livermore National Laboratory, Yong-Bee Lim, is taking on the 2017 ASM Biothreats conference and the pipette-slinging world of synthetic biology. Lim first focuses on the panel at ASM’s conference, which looked at the current state of synbio and where the future might take us. Like most things in life, there’s also a flip side to that coin – the negative aspects of this new technology. “While the benefits derived from synthetic biology are great, presenters noted that it suffers from the dual-use dilemma: the same information applied to beneficial uses could also be repurposed for nefarious purposes. Dr. Hassell noted that synthetic biology increases biologically-derived risks through three mechanisms. First, synthetic biology can be used to enhance existing microbial threats; synthetic biology allows actors to more easily manipulate the characteristics of microbes, including increasing environmental stability and introducing hypervirulence. Secondly, traditional methods of restricting access to biological select agents and toxins (BSATs) may be less effective in an age where synthetic biology can be used to construct microbes de novo. Finally, synthetic biology can be used to construct novel threats that are meant to subvert countermeasures.” Lastly, one of the most interesting components to this presentation and Lim’s article is the underknown components to synethic biology. The erosion of the knowledge and technical barriers and the rise of the do-it-yourself (DIY) practitioners all give way to a new frontier in terms of benefits and dangers. This week, the U.S. Patent Office appeal board ruled that the dispute regarding the discoveries between the University of California, Berkeley and the Broad Institute do not overlap. “The ruling is a win for the Broad Institute, which had asked for the finding of no interference. It will be able to retain its valuable patents, which cover the use of CRISPR in human and animal cells. In a statement, Berkeley said it “respects” the decision but still maintains that Berkeley biochemist Jennifer Doudna and European collaborator Emmanuel Charpentier were the first to invent the CRISPR system.” The CRISPR patent dispute has brought to light the most foundational question of who truly owns the patent rights to CRISPR work in animals and plants. This new development doesn’t mark the end of the CRISPR dispute, as many expect Berkeley to appeal the decision and the Broad Institute’s patent is facing dispute from other researchers, including the Rockefeller University. While the CRISPR patent road may have been smoothed for a bit, it will continue to remain rocky and cause ripples for business developments and the biotech industry. In this Government Accountability Office (GAO) report, they found that the DoD should utilize guidance developed to aid in support of civil authorities (specifically HHS and DHS). “HHS and DHS have plans to guide their response to a pandemic, but their plans do not explain how they would respond in a resource-constrained environment in which capabilities like those provided by DOD are limited. DOD coordinates with the agencies, but existing coordination mechanisms among HHS, DHS, and DOD could be used to improve preparedness. HHS’s Pandemic Influenza Plan is the departmental blueprint for its preparedness and response to an influenza pandemic.” The GAO’s goal was to assess the DoD’s plans and processes to support civil authorities during a pandemic, of which they found that the existing coordination mechanisms should be used to explore opportunities to improve preparedness if their capabilities are limited. Global health security is a finicky creature as it requires cooperation and transparency from all countries. One weak link in the chain can cause an international public health crisis. No More Epidemics is imploring countries to publish their Joint External Evaluations (JEE) performed by the GHSA (Global Health Security Agenda). As of now, only Ethiopia, Liberia, Peru, Uganda, UK, and the U.S. have openly shared their JEE’s. “Knowledge of baseline data provided by the JEE will result in more effective programming, prevention and detection of infectious disease outbreaks and early response. The JEE and roadmap processes are critical tools for civil society to use in developing appropriate and adequate programming to help countries close health systems gaps and become IHR-compliant. Transparency and accountability are vital in addressing global health threats. No More Epidemics urges all countries carrying out their Joint External Evaluations to make the results publicly available and for these to be made available on the World Health Organization’s Strategic Partnership Portal, the online repository for tracking funding, donor profiles and country level data.” Information sharing is also a mechanism for strengthening partnerships among countries. Doctors Without Borders (MSF) will be hosting this live webinar on Thursday, February 23rd at 8pm EST. Following the publication of the book, The Politics of Fear: Médecins Sans Frontières and the West African Ebola Epidemic, the MSF webinar will do a deep-dive into the 2014/2015 outbreak and the lessons learned. This event will include a panel of MSF experts, who were directly involved in the MSF response in West Africa. The battle against antimicrobial resistance (AMR) isn’t slowing and the proposed strategies emphasize the need for increased research and development of new antimicrobial agents, which means we’re running out of options. Swinburne University is trying a new tactic though – physics. “Elena Ivanova was studying physical surfaces that could repel bacteria before they even had time to settle. In clinical settings, such as hospitals and dental practices, 80% of infections are caused by bacteria that cling to surfaces in such densities that no antibiotic can remove them. First, she tried making surfaces so smooth that bacteria would, theoretically, simply slide off. Although that was the case for some bacteria, many others—such as the common Staphococcus aureus, or staph—still managed to cling on and multiply.” This is where Greg and Jolanta Watson come in – they have amassed a huge collection of biological samples in their laboratory. Ivanova and the Watsons communicated back and forth regarding natural properties that might make bacteria incapable of sticking to and growing on surfaces. Starting with cicada wings, Ivanova found that it was able to kill one of the two main types of bacteria, which was a partial success. Next, a gecko’s skin was tested, which revealed a wealth of knowledge. “Green had added a sample of the small, rod-shaped bacterium that causes gingivitis, Porphyromonas gingivalis, to the surface. In total, he added around 10 million microbes every day for a week. What’s more, this mass of microbes was given everything that they needed for a good life: a constant temperature of 98.6˚ F, an atmosphere without oxygen, and a daily ration of food. Regardless, after the week, nearly all were punctured and torn, their cellular carcasses strewn over the gecko skin. ‘Bacteria are trying to move and settle on the surface,’ Green says. ‘And they’re just getting spiked and skewered by these long hairs’.” Looking to nature, these researchers have focused on the physics of repelling bacterial growth, which may help broaden the arsenal against resistant germs. Talking About Bioethics & Policy in the U.S. Under the Trump Administration – Dual-use research of concern, CDC’s new quarantine rule, and the Animal Rule are all topics involving bioethics and Johns Hopkins University is hoping to provide the resources needed to address these complex issues. The new administration brings with it concerns over vaccine skepticism and how they will handle these bioethical dilemmas. How will Trump address the work of biotechnology and public health crises? Breaking Barriers: Women in Science Event: Don’t miss this March 8th event at 6pm at Top of the Town in Arlington, VA. The 3rd annual reception will “bring together scientific, political, and cultural leaders to celebrate the achievements of women in STEM and take a stand for the critical role women play in science and technology communities”. The Cost of Biosecurity – For $1 million a year, you can buy yourself global biosecurity! A recently published list of the unit staff costs from the 2017 BWC Meeting of State Parties, gives an eye-opening revelation into the cost of biodefense. For $1.1 million a year, you can financially support the implementation unit staff of the BWC – quite a bargain, no? Surprise Us, Mr. Trump – A Letter From the Global Health Community – In this editorial article from The Lancet Global Health, the authors point to the role of the U.S. in the WHO Executive Board and the future of WHO leadership. “Two legislative bills introduced in early January in the US House of Representatives and Senate are seeking to withhold funds from the UN and open a way for the USA to leave the global body, and therefore withdraw membership of WHO.” The current political and global health atmosphere is unsettled, which has many concerned about the future of U.S. involvement in global health programs. Welcome to September! Let’s start the month off with a yellow fever timeline and the history of this misunderstood disease. If a gin and tonic is your go-to drink, you’ll be pleased to hear it was actually born to combat malaria. Many are questioning if Syria has retained a stockpile of chemical weapons, pointing to continued contradictions and discrepancies regarding inventories and more. While the topic of sanctions is being debated, findings from recent international reports determined that both the Syrian government and ISIS were responsible for chemical attacks in 2014 and 2015. On Tuesday, the French ambassador to the UN pushed for unified action at the Security Council, emphasizing that within the report, the Assad regime and the Daesh terrorist group have been responsible for several attacks. Please join the newly elected Coordinator, Jamechia Hoyle, for a happy hour and networking event. Come engage with a network of talented Global Health Security professionals. Share ideas, connect, and learn how to join the world of global health security! You can RSVP to nextgenghsa@gmail.com by September 5th – the event is Friday, September 9th, from 5-7pm, at District Commons DC, 2200 Pennsylvania Avenue Northwest, Washington, DC 20037. Is Accessible Synthetic Biology Making DIY Bioweapons More Likely? The biotech industrial revolution and advances with CRISPR-Cas9 have raised many red flags about the risk for do-it-yourself (DIY) bioweapons. Dr. Koblentz and several others discussed the role of gene-editing technologies in the UN Security Council meeting last week, with General-Secretary Ban noting that these advances have made the production and application of WMD’s easier. These advances have the potential to move the playing field away from solely state-sponsored or university-level programs, to lower levels of necessary tacit knowledge. The dilemma surrounding dual-use technologies of concern and biosafety failures compound these concerns – are we becoming more and more vulnerable to intentional or accidental events? Antibiotic resistance is also a growing dilemma, and not just what we’re facing now, but also the risk that synthetic biotechnology could make the development of a highly resistant organism possible for malicious persons. The tricky part is combating the risk for mis-use while not stifling innovation – any takers? The growing threat potential of synthetic biology has many commenting that “Zika is just the first front in the 21st century biowar”. We so easily think nuclear or cyber warfare when it comes to large-scale threats, but the truth is that biological threats have been looming in front of us for years. James Stavridis notes that there three key components to preparing for the biological revolution. “First, we need an international approach that seeks to limit the proliferation of highly dangerous technologies (much as we try to accomplish with nuclear weapons) and fosters cooperation in the case of contagion or a transnational biological threat.” Second, U.S. government interagency practices need to strengthen their capacity to address both scientific advances and security threats from the biological research sector. Lastly, there must be private-public cooperation. He points to the need for a stronger marriage between government and academia, but in such a manner that doesn’t deter innovation. In the end, there is a imperative need for more frequent and frank discussions about the impending realities of biological threats. GMU Biodefense Graduate Program Open Houses! If you enjoyed reading about Dr. Koblentz and his work in biodefense, consider joining GMU’s Biodefense graduate program as a MS or PhD student! We’ve got some great Open Houses coming up- there is a PhD Information Session next Wednesday, September 7th at 7pm at our Arlington Campus in Founders Hall in room 134. 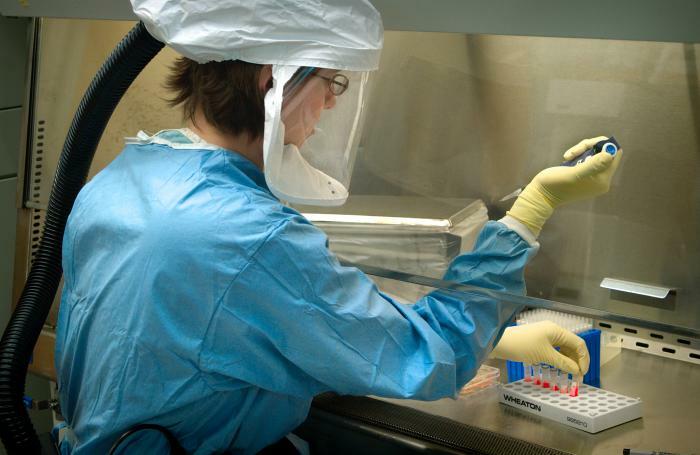 If you’re interested in a MS in Biodefense (we offer both online and in-person! ), come to our next Open House on Thursday, September 15th, at 6:30pm in our Arlington Campus Founder’s Hall, Room 126. Dr. Koblentz will be leading the information sessions, which will give you both some insight into the program, but also the range of student research and careers. Venturing through the caves of South Africa, virus hunting researchers take us through the journey that is zoonotic disease tracking. The CDC has ten global disease detection centers and programs, like PREDICT, are all working to study the early signs of outbreaks and how we can prevent them from happening. “We were tracking almost 300 infectious disease outbreaks of concern in 145 countries,” says Dr. Jordan Tappero, director of the Global Health Protection Center at CDC. This was during a 2-year period. “Only about 30% of countries even self-report [and] are able to prevent, detect, and respond to infectious disease outbreaks,” Tappero says. “We are working around the world to try and improve capacity so that we have partners everywhere to respond quickly.” Bats are one of the primary animals studied, as they tend to be a reservoir for many diseases. Much of the research looks to test animals to identify what diseases are circulating within them, which acts as an early warning system for potential outbreaks. Outbreaks like MERS-CoV and Ebola have taught us the importance of early warning systems within the germ world. Cheers to those brave researchers who are crawling through caves and bat guano – we applaud and thank you! After the measles outbreak in California and Arizona related to Disneyland in 2015, there was a surge of national attention to pediatric vaccination exemptions. While California is taking strides to reduce non-medically indicated exemptions, many doctors are still reporting that parents are refusing to vaccinate their children. A recent study was published using data from the American Academy of Pediatrics Periodic Surveys from 2006 and 2013, looking at parental noncompliance and the frequency of requests for vaccine delays and refusals. Researchers also looked at the impact on US pediatrician behavior as a result of parental refusal or requests to delay. The study found that the proportion of pediatricians reporting parental vaccine refusal increased from 74.5% in 2006 to 87.0% in 2013. “Pediatricians perceive that parents are increasingly refusing vaccinations because parents believe they are unnecessary (63.4% in 2006 vs 73.1% in 2013; P = .002). A total of 75.0% of pediatricians reported that parents delay vaccines because of concern about discomfort, and 72.5% indicated that they delay because of concern for immune system burden. In 2006, 6.1% of pediatricians reported “always” dismissing patients for continued vaccine refusal, and by 2013 that percentage increased to 11.7% (P = .004).” Sadly, these findings indicate that pediatricians are reporting more vaccine-refusing parents and while they provide vaccine education, they’re dismissing patients at a higher rate. The FDA has announced that all U.S. blood banks will test blood, regardless of the presence of Zika in the state, for the virus. Here’s a guide to help pregnant women reduce their Zika risk. A new report found that Zika was linked to congenital hearing loss in infants with microcephaly. This week, CDC Director, Dr. Tom Frieden, commented that the agency is almost out of funds for Zika. “Basically, we are out of money and we need Congress to act,” Frieden told reporters. “The cupboard is bare.” Florida may be the perfect place for Zika transmission, but where else should we consider within the U.S.? Singapore is quickly becoming a Zika hot spot, with it being the only Asian country to have active transmission. The growing volume of cases is signaling that Singapore could easily be a new epicenter for Zika, triggering surrounding countries to ramp up their preparedness efforts. Many are wondering if Zika is a sleeping giant in Haiti. The country has all the ingredients for rapid and sustained transmission but hasn’t seen many cases yet, leaving many to wonder if it’ll hit. The CDC has reported, as of August 31st, 2,722 cases of Zika virus in the U.S. Yesterday, the Florida Department of Agriculture and Consumer Services officially announced that, for the first time, mosquitoes trapped in the continental U.S. were positive for Zika virus. Attend the Nonproliferation Review’s Monday, September 12th event to discuss nonproliferation! The event will be held at the James Martin Center for Nonproliferation Studies CNS Washington office at 1400 K Street, NW, Suite 1225, on Monday, 9/12, from 1-3 pm. Speakers include Rebecca Hersman, director of the Project on Nuclear Issues at the Center for Strategic and International Studies; Robert Peters, senior research fellow at the Center for the Study of Weapons of Mass Destruction at National Defense University; and Dr. Philipp Bleek, assistant professor at the Middlebury Institute for International Studies at Monterey and a fellow at CNS. Dr. Chen Kane, director of CNS’s Middle East nonproliferation program, will chair the event, with NPR Editor Joshua H. Pollack providing welcoming remarks. Foreign Policy Classroom – U.S. Efforts to Combat Zika – Catch the series featuring Gwen Tobert, Foreign Affairs Officer, Office of International Health and Biodefense. You must be a student enrolled in a U.S. academic institution or faculty to attend the September 8th (2-3pm) event at the U.S. Department of State. GMU Biodefense Deputy Director Dr. Gregory Koblentz has a slew of new publications out of topics ranging from the nexus of bioweapons and cybersecurity to new frameworks for understanding chem/bio threats. Dr. Koblentz also co-published an article with GMU Biodefense PhD student Brian Mazanec, “Viral Warfare: Security Implications of Cyber and Biological Weapons” – the article examines the relatively emergent threats of biological and cyber warfare, exposing several commonalities between the two. The article was published in the November issue of Comparative Strategy, available here (access required). Finally, Koblentz has a new review out in Foreign Affairs, on Eric Schlosser’s new book, Command and Control: Nuclear Weapons, the Damascus Accident, and the Illusion of Safety. The first paragraph is below – read the rest here. Between 1950 and 1980, the United States experienced a reported 32 “broken arrows,” the military’s term for accidents involving nuclear weapons. The last of these occurred in September 1980, at a U.S. Air Force base in Damascus, Arkansas. It started when a young technician performing routine maintenance on a Titan II missile housed in an underground silo dropped a socket wrench. The wrench punctured the missile’s fuel tank. As the highly toxic and flammable fuel leaked from the missile, officers and airmen scrambled to diagnose the problem and fix it. Their efforts ultimately failed, and eight hours after the fuel tank ruptured, it exploded with tremendous force. The detonation of the missile’s liquid fuel was powerful enough to throw the silo’s 740-ton blast door more than 200 yards and send a fireball hundreds of feet into the night sky. The missile’s nine-megaton thermo­nuclear warhead — the most powerful ever deployed by the United States — was found, relatively intact, in a ditch 200 yards away from the silo.